Enjoy one of your favorite Mexican style dishes in the form of a pasta casserole with this tasty Seafood Enchilada Pasta Bake. 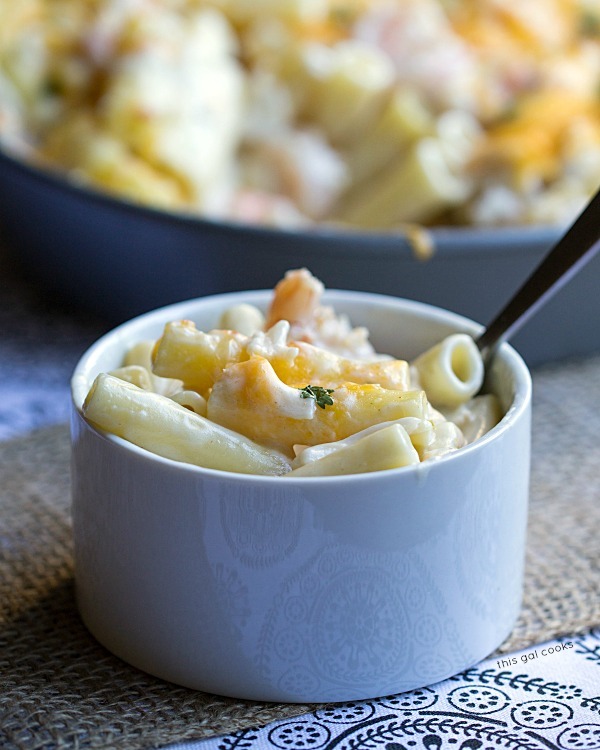 This dish is filled with seafood, creamy sauce and topped with shredded cheese! If you could only eat one type of food for the rest of your life, what would it be? Hands down, I would choose Mexican food. I just can’t get enough of it. There are so many different ways to enjoy it, I doubt I would ever get sick of it. I haven’t gotten sick of it yet and I often have some form of it on a weekly basis. A while back I made a seafood enchilada recipe that I found in my Better Homes and Gardens New Cookbook. It was quite divine. The creamy sauce is what really made the recipe pop. And of course, the seafood. I decided to give the recipe a try again, only this time I would give it my own twist. Pasta pairs well with creamy sauces so I thought, why not make those enchiladas into a pasta dish? I used shrimp and imitation crab meat in this recipe. Don’t hate. I know some people turn their nose up to imitation crab meat but I don’t. I’m not ashamed to admit that I like it! It tastes good. And it’s a helluva lot cheaper than the lump crab meat I buy when I make a fancy dish, like this Roasted Poblano and Crab Chowder or these Crab Cakes with Sweet Chili Lime Sauce. However, if you have lump crab on hand, you may use that, too! This recipe is pretty easy to put together. Saute some veggies, add the shrimp and imitation crab meat, add the sour cream to make it nice and creamy, place in a baking dish and top with shredded cheese. Bake it until the cheese is bubbly. If you want to be fancy like me, you can garnish with cilantro. Heck, even if you don’t want to be fancy, I recommend garnishing with cilantro. But I’m quite partial to cilantro. It’s one of my favorite herbs. Cook the pasta to your preferred tenderness. Drain and set aside. Sprinkle the shrimp with old bay seasoning. Toss to coat. Melt the butter in a large saute pan or pot. Add the onion, garlic and jalapeno and cook over medium low heat until tender. Add the shrimp, imitation crab meat, sherry and chicken broth and cook until the shrimp are opaque. Break up the imitation crab meat while the mixture is cooking. Whisk together the sour cream, white pepper and flour. Add to the seafood mixture and mix well. Reduce heat to low and simmer until thickened. Mix in the pasta and then pour the mixture into a 9 inch baking dish. I used a round cake pan. Top with the shredded cheese. Bake for 10 minutes. Then turn on the broiler and broil until the cheese is bubbly and slightly browned. Oh I know his would be good with some lobster. Or scallops. I LOVE scallops! Thanks for stopping by! Ashley! This pasta bake looks delicious! 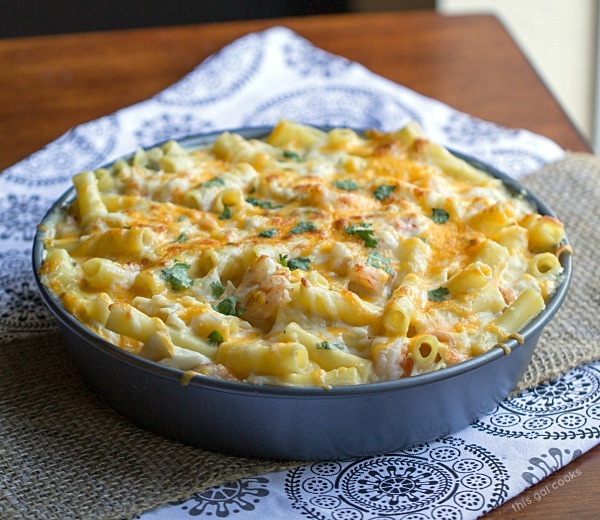 So creamy and full of cheesy goodness :D I’m gotta make this soon! Pinning!! Thank you so much, Cindy! This is definitely a recipe that I’ll be making again! Thanks for the pin. Mine would be sandwiches or breakfast food hehehe. Although I’d never say no to Mexican and cheese. Lots of cheese! This pasta bake looks utterly scrumptious, I’m drooling now! I love pasta and this dish looks fantastic… pretty pictures too! Have a good week!! Pinning! It’s delicious, Emily! You’ll love it! Yum! The creamy with the spicy and seafood and pasta, yeah basically this dish is perfect! Love the twist you put on this one and can’t wait to try out the Roasted Poblano & Crab Chowder! YUM! P.S. I’m all about the cheaper too. Pinning! 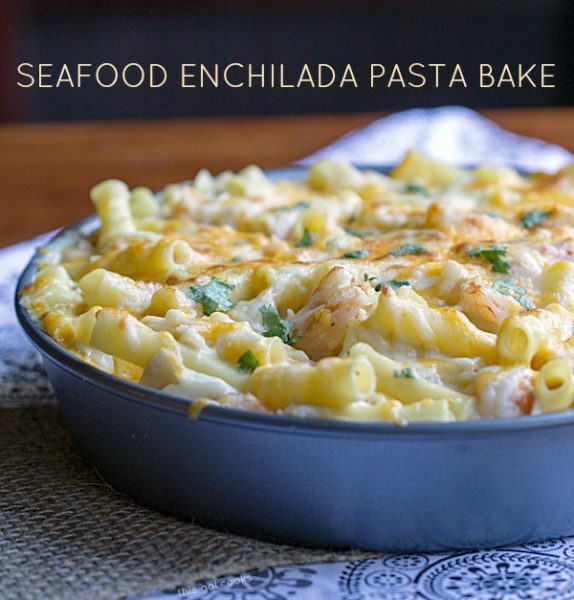 This combines all my favorite things: cheese, enchiladas, and seafood! What a great recipe, Julie, and beautiful photos too! Julie, I love seafood and pasta and this recipe is going on my ‘to make’ list. Thanks for sharing…had to pin this! Thanks for stopping by and for the pin, Joan! Ohhhh yes, yes, yes. I am so all over this. YUM and I need some right now. Pinned!! Looks absolutely delish, Julie! I always notice that the chefs/judges on cooking shows say “no cheese with fish” but I think in some circumstances they are off target with that thought. 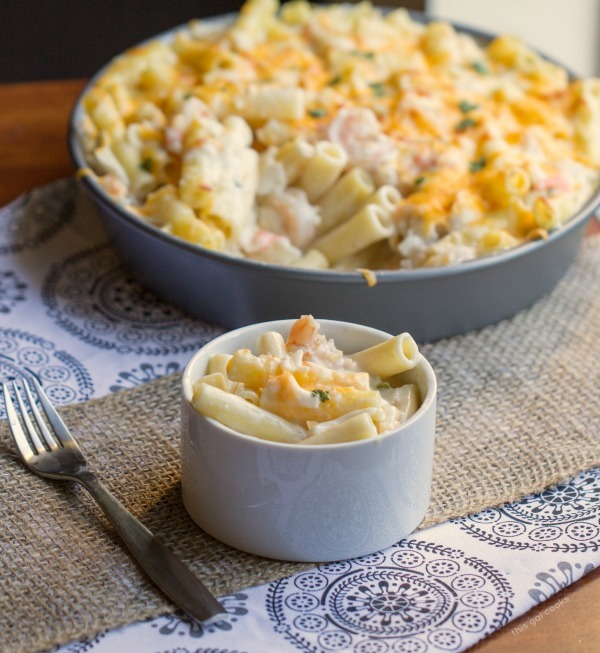 This cheesy topping looks wonderful and is a great paring with the creamy sauce on your seafood bake. Yum! You know, I hear that too but fish tacos are so good topped with cheese. And of course, this enchilada pasta bake! And growing up here in FL, I always had cheese grits with my fish. I know the cheese wasn’t on the fish but it was a side! Thanks for stopping by, Holly! Of course a dessert is a type of food! Ah, and just think of all of the good desserts you would be able to eat! Thanks so much for stopping by, Tina! Mmmmm! I can’t wait to try this, I just picked up some shrimp and crab at the seafood market. Oh yum!! My husband will love this! Thanks Julie! abounds. This would be a delicious way to use some of it—be it crab or salmon or shrimp. Oh yeah, crab, salmon, scallops. This would be good with all of them. Thanks for stopping by, Carol! Made this for dinner today….SOOO GOOD!!!! Loved the recipe. I don’t recommend turning the broiler on with a glass casserole dish. The cheese will melt without it and the dish could explode. Thanks for stopping by. I’m glad you enjoyed the recipe! Can you use real crab instead of the imitation? will it make any difference? Sure, you could use real crab instead of the imitation. I would have done that if I felt like paying $10.99 for 16oz of crab meat! :) Let me know how it turns out if you make it with the real crab. The recipe looks awsome but I have a question……. what makes this an “enchilada” dish? The sauce that I used for this recipe is the same sauce that I used to make seafood enchiladas a while back. The sauce was adapted from a recipe from The Better Homes and Gardens New Cookbook, as noted in the post. Made this tonight and it was yummy! Needed to clean fridge of sour cream and a bag of frozen mixed seafood. Used lobster stock (better than boullion brand) and threw in some leftover grape tomatoes. Just put some parmesan on top. Reminds me of lobster bisque, my favorite soup. Comfort food for the frigid nights we’re having. LOVE the additions you made to the recipe, Virginia! I just love grape tomatoes and will have to add some the next time I make this! Thanks for stopping by to let me know you enjoyed the recipe. Can I use something instead of sherry? Not a big fan of the flavor it brings. You could try a dry white wine, such as pinio grigio. Hope this helps! I made this dish for dinner two nights ago. Didn’t have a jalapeno but will use one next time. I bet the zing is great! In addition to the sweet onion, I garnished the dish with a thinly sliced green onion right out of the garden. Hubby complimented it twice and took a huge dish for his lunch the next day. We had the rest for dinner tonight, and it’s even better left over! The imitation carb meat ingredient which you said in the recipe is the flaked one or else? Can i use cream cheese instead of using sour cream? I think I used the type that flakes easily. I’ve made it a few times and usually used whichever type was on sale. I’ve never made it with cream cheese so I cannot answer that question with certainty.